Home » Community » Cookbook Lab » The official La Dolce Vegan! review thread (to be updated). Add recipe reviews for La Dolce Vegan! : Vegan Livin' Made Easy by Sarah Kramer here, and they will be added to the list. Thanks again to dannibazaar for this list! Cinnamon Walnut Coffee Cake - Very good! One of my favourite coffee cakes to make. I always replace the walnuts with almonds. Breakfast Brown Rice Pudding - Pretty good. A bit too liquidy, but that could be on my part. Danica's Popcorn Balls - Didn't work out for me. That is probably because I used tub margarine (smart balance lite with flax). I might try this again with EB. Frenchie Onion Soup - Yummy! I should make this again soon. Seaweed Soup - This gave me a stomach ache for some reason. Will not make again any time soon. Simple Leek and Potato Soup - Simple and delicious. It's just your basic leek and potato soup, but what's wrong with that? It's a keeper. Quick Ginger Carrot Soup - Pretty good. I prefer carrot soups that have curry powder in them, but this was good enough to enjoy thoroughly. Tomato Cabbage Soup - Tasted just like the title would suggest. Cabbage soup that's tomato-y. Good for what it is, I guess. It's not something I would make a lot. Wendy's Lentil and Brown Rice Casserole - Okayish. Not overly flavourful or anything like that. Just meh. Magnificent Mixed Beans and Bulgur- Didn't work out well. The bulgur never ended up cooking. Cinnamon Doughnut Holes - Weird. I didn't like these at all. Hal's Maple Flax Brownies - I like these. The combo of maple and chocolate is actually rather tasty. Wolffie's Snickerdoodles - Not snickerdoodle-y at all. More like a cinnamon-sugar cookie. But good anyways. Just not a snickerdoodle. Rachel's Chocolate Chip Cookies - Not the best, but not the worst. I'm not big on cookies that have tofu in them. Wolffie's Peanut Butter Cookies - Eh...I didn't like these. They were crispy, which I don't like in a pb cookie. Siue's Chocolate Chocolate Brownie Cheesecake - I wanted this to work, but um...it didn't. I'm not exactly sure how it was supposed to turn out, but I'm sure whatever happened to mine wasn't right. It was flat and just...wrong. Yella Cake - My go-to vanilla cake. Just love it. It always works, but in cake and cupcake form. Sharon's Black Pepper Coffee Cake - My go-to for coffee cakes. It's just so yummy...I love the cinnamon-sugar topping, and the cake is so moist and delicious. I can even make it a little low-fat without it tasting like it is. Tara's Chocolate Cake - Pretty much just like a typical wacky cake. Always dependable. Easy French Bread - For some reason this ends up different from the recipe from GOV. Good all the same, but I prefer the other. Sassy Sandwich Bread - I have a loaf of this going at all times. I just LOVE it. It is the best. Wolffie's Banana Blueberry Muffins - Awesome! I love everything about them...the combo of blueberry, banana, and molasses is so tasty. Stephanie's Sugarless Power Muffins - I like these quite a bit. They taste healthy, which I dig. I usually add chopped almonds for a textural kick. Brown Rice Flour Banana Bread - Yummy, considering I've never been a fan of banana bread. I love it was a shmear of raspberry jam or marmalade. Homemade Graham Crackers - Not very graham cracker-y. Needs more molasses. So good! I didn't measure the basil, but used way more. This sauce is so fresh and tasty. I wouldn't normally process a fresh tomato sauce, but this works really well. It gets a little watery, but I don't mind. I would only suggest adding more basil, but it doesn't need anything else. Will definitely make again. Only takes the time for the pasta to cook. These are delicious! I always love molasses in banana bread recipes. I used whole wheat pastry flour, so they were a little dense, but still moist. I used 2 sm-med bananas, reduced the sugar to 1/2 cup and only used 3 tbsp of oil. I used grated fresh ginger instead of ground and used more than a tsp because we love ginger. I baked them for the entire 25 minutes. I will probably make these again. The Pasta with 5 Minute Roasted Red Pepper Pesto was one of the first dishes I made as a newbie vegan and it has become an instant favourite! I've made several times already -- such an easy recipe & really yummy. I served it to mega-omni friends and they loved it so much they asked me for the recipe! I'm not using as much garlic as the recipe calls for though. And if I don't have enough fresh basil I (partly) use a basil herb cube instead. I like this easy dressing although it's pretty salty. I've made it with red miso and will try white next time. Especially good in a salad with legumes like green beans. A nice addition to (for example) a Mexican meal but it doesn't really taste like sour cream. This is very good but the tofu needs to be drained. I reviewed this recipe in depth on my blog, www.peacefultable.blogspot. Thanks for this page on VegWeb! Lehua, not sure what's up but the link to your blog isn't working for me. Thanks db...it's an awesome blog! Delicious! P said this was his favorite bread I've made, and one of his favorite things overall. I didn't have huge expectations for it, because it seemed like it'd be pretty normal, but it turned out really well. I used my stand mixer/dough hook, and probably about 3 1/2 cups flour. I made 2 medium loaves. 1/4 cup sesame seeds is too much to toast for these. I would maybe do 22 minutes next time, instead of 20, but P liked everything as is. I don't really think you can test bread with a toothpick? That won't necessarily tell you that it's actually done. Anyway, great, easy bread. I believe you should knock on bread to hear a hollow sound, meaning it's done? 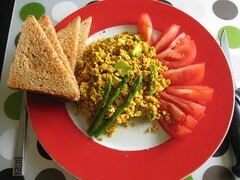 BTW I didn't use the salsa recipe from La Dolce Vegan for this scramble but another homemade salsa picante. Of course it's important which salsa you use since it has such an important role in this dish. A nice, hearty gravy. I used cremini mushroom because they have a stronger taste and opted for the chunky version instead of putting it in the blender. 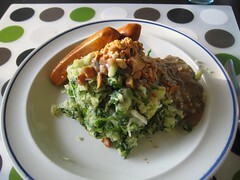 I added some chopped cashews (15 gr) for a topping and the nutty flavour was a great addition. When I try the smooth version next time I'll probably make the cashews part of the sauce. Oh yeah. I knew about the tapping on it to see it's done and whatnot, I only said that because she mentions using a toothpick to test it, and I thought that was weird! Thanks! Pretty good. Nothing special. I don't know that the rice vinegar is all that noticeable. I think it would be fine to substitute apple cider or white vinegar. I used fresh basil and added some red chili flakes for a little spice.